I'd like to introduce you to Pink Chalk Fabrics! Kathy Mack is the creative force behind Pink Chalk Fabrics & Pink Chalk Studio. I asked Kathy some questions so you could learn a bit more about Pink Chalk! How did you get into sewing and quilting? Sewing has been a passion since my grandmother first taught me how to use a needle and thread as a little girl. I took a very long break during my career days but re-connected with my sewing machine after the birth of my second daughter. I left my job, did a lot of volunteer work, stayed home full time to raise my kids and eventually discovered the online world of craft blogs. March 10th will be Pink Chalk Studio's 5 year blog anniversary! How did it all happen? In an attempt to create a lifestyle where I could continue being at home when my kids got off the bus and make money I've thrown a lot of spaghetti at the wall. I now have a line of sewing patterns (Pink Chalk Studio) and an online fabric shop (Pink Chalk Fabrics) that outgrew my house and is now a full-time business with 6 employees. Those were the noodles that stuck. Way more fell to the floor! I always encourage crafters to continue the journey even when things fail. It's all part of the process and you'll be surprised where it will lead you. What's new at Pink Chalk? Pink Chalk Fabrics recently hosted its first onsite charity sewing event at the shop. In 2011, my team and I are working to creatively integrate Pink Chalk Fabrics into the community while still focusing on our primary business of online fabric and pattern sales. Tell us what makes Pink Chalk special! Pink Chalk Fabrics specializes in fabrics and patterns for modern sewists. In addition to the popular designers we carry a wide selection of Japanese Import fabrics and Solids. 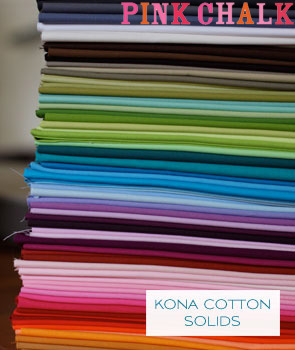 Shoppers will find over 135 Kona Cotton colors, all 100 Free Spirit Solids, the full collection of Amy Butler Solids, and many more basics including Grunge by Basic Grey, Kaffe Fassett Shot Cottons, Organic Solids, Crossweave Wovens, and Flannel Solids. Our sewing patterns include quilts, handbags and clothing with over 100 independent designers represented. 195 pattern titles are available as instant downloads. I'm especially proud to support so many first time pattern designers. One of the first time pattern designers that Kathy decided to believe in is me! Kathy has my patterns in her shop and I really appreciate her support. One of the best things about Pink Chalk is that all patterns ship for free in the US! Pink Chalk has an amazing fabric selection. Here are a few of the things I'm loving at the moment. I'm kinda on a blue and orange kick at the moment! Kathy has a great giveaway that she has provided for you!! of Far Far Away II by Heather Ross! That's over $80 in yummy fabric!! Leave a comment sharing which Japanese Import Fabric is your favorite. Check out Pink Chalk Fabrics on Facebook & "Like" their new page. Sign up to receive Pink Chalk Fabrics Newsletter. & come back to let me know! You have till 10pm EST on Wednesday the 9th to enter! comment moderation is on so if you don't see your comment right away that is why! Parkside Harmony please contact me with your info! I liked Pink Chalk on facebook. Thanks for such a generous offer! I "liked" Pink Chalk fabrics on Facebook! I have been a fan of Pink Chalk Fabrics for several years. I like the fabric by Echino. The patterns by Etsuko Furuya look interesting. I signed up for Pink Chalk's newsletter! I tweeted about the giveaway and put a post on Facebook! They are all really fun, but I love the Atelier Akiko Rose Stripe Blue Natural! 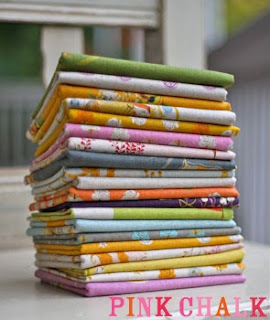 I love Sarah Fielke's Little Things fabric! I like the train station Kokka fabric. I aleady subscribe to Pink Chalk's newletter! Kokka Train Station Animal Friends in purple! And I subscribe to the Pink Chalk Newsletter! is just divine. would love yards and yards of it. thanks. I posted a blog about the giveaway!!! Thanks for the chances to win! Love anything by Echino, but especially love the birdy lines. Hi, I already follow Pink Chalk's blog and receive the newsletter too! Ooh! Enter me please! I "liked" the facebook page! Also, about Japanese import fabric, I used some robot fabric from Kokka on my last quilt and it was super adorable. I like Pink Chalk Fabrics on FB! I already get Pink Chalk's newsletter. I'm a new sewer and didn't know about Pink Chalk fabrics. Thank you for introducing me to another fabulous sewing resource. I have subscribed to their newsletter. I like pink chalk on facebook! i signed up for the newsletter on pink chalk fabrics!! I "liked" Pink Chalk fabrics on fb. I signed up for Pink Chalk's newsletter. My favorite import is the Kokka Trefle Sewing Notions,Sew Couture, etc, of course! LOL! I "Liked" the FB page! And I am now signed up to get the newsletter... yee HAW... after months of not feeling well I'm finally getting my sewing, quilting, crafting vibe back!!! YES! I've "liked" Pink Chalk for a long time. and finally, my favorite japanese print: it's a tie between Echino's Glasses and Woodland Black. I already LOVE Pink Chalk on Facebook!!! It is one of my favorite stores!!! and sites....I would love to win that awesome fabric bundle. I love the glasses by Echino. I really "Like" Pink Chalk on Facebook! I am already signed up for Pink Chalks newsletter! I hope this doesn't disqualify me from winning that beautiful bundle of fabrics. Pink Chalk newsletter subscription is confirmed! I liked their page on Facebook. I love the Echino prints at the moment. I couldn't choose just ONE Japanese import! I like these: Echino, Isso Ecco & Heart, Ruby Star Rising, and the Kikka Trefle Sewing Notions (large) would make great appliques! I like Pink Chalk on FB. I have signed up for your newletter. I have signed up for the Pink Chalk newsletter. I already get the Pink Chalk Newsletter. wonderful giveaway! My current fave is anything in the Ruby Star Rising line - currently getting harder to get hold of - I tried Pink Chalk for it but couldn't get the lines I was after! OK, that sounds negative, what I was trying to say was that Pink Chalk is one of the shops I window shop in often! My fave Japanese import is the Hideaway Clock fabric - thanks for posting it, I might never have seen it! I now like Pink Chalk Fabrics on Facebook. My favorite Japanese fabric line is Echino. Very cute fabrics. Like everyone else, almost, I'm very fond of the echino prints, particularly the Woodland fabric but I cant decide if I prefer black over pink. I LOVE the Echino Rondo Stripe in Spring ~ so much you could do with that print! And her fabric shop is great, and her customer service is fantastic! THANKS for the chance! I signed up for the Pink Chalk newsletter. Thanks for introducing me to Pink Chalk. Definitely one I will be using. I love the Atelier Akiko Rose Script Blue Natural fabric. That would go perfectly in my office! Thanks for the chance! I blogged about this awesome giveaway. Thanks again for the opportunity to win. I also like on Facebook. I definitely lack the funds to own even one Japanese import fabric, but I drool over those tiny top elephants every time I see them! I'm all signed up for the newsletter! I like PCF on Facebook! My all time favorite japanese import would be the panther print from echino. I love it in each and every colour story. I would really love to win! And I am signed up for Pink Chalk's newsletter! I'm liking Isso Ecco & Heart Flower Grey from the Japanese fabric lines. I just subscribed to Pink Chalk's newsletter! I 'liked' Heather's fabies on FB! I like the echino orange helicopters, mainly b/c my youngest LOVES orange, and helicopters. The glasses are very appealing, too. I have loved Pink Chalk Fabric for awhile now!!! Just subscribed to Pink Chalk's newsletter! I have subscribed to the Pink Chalk newsletter. Isso Echo & Heart Flowers is my favorite - been looking for 2 weeks for a fabric that had both that shade of green AND red in it! I like echino by Etsuko Furuya Winter 2011 Madrigal Black. I liked Pink Chalk on Facebook. I blogged about this giveaway at miscellayneous.blogspot.com ! Thanks! My favorite Japanese Import fabric is the Flower Sugar line by Lecien. I have a huge stack to make a king sized quilt for my bed. My favorite Japanese Import Fabric is Isso Ecco & Heart Flower Natural. 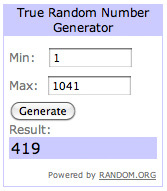 Thanks for the opportunity to enter your giveaway! I like the Isso Ecco Heart Daisy pink chocolate the best, I think ... tough decision. I signed up for the newsletter ... thanks for the opportunity! I love all by Etsuko Furuya. But at the moment my favourite would have to be echino by Etsuko Furuya Winter 2011 Rondo Stripe Spring> LOVE IT. I have also hit "LIKE" on the facebook. And will also post a link directly to the shop on my Facebook company page. And I look forward to the news letter as well. Thank you for the giveaway opportunity. I already get the pink chalk fabrics newsletter. I love Kathy at pink chalk fabrics. Her collection of solids is incredible. Kathy and her staff were kind enough to help me pull together 12 solids for a recent project. Etsuko Furuya echino fall line is really cool. I'm claiming that as my favorite right now. I have never used Japanse import fabric before but the far far away II line is calling for me. I signed up for the news letter. I've totally "liked" Pink Chalk Fabrics on facebook. This is such a great giveaway. I've been getting Pink Chalk's newsletter for a few months now. I tweeted about Pink Chalk and all the wonderful fabrics and patterns there. okay, I totally am blogging about the giveaway and your blog my lady. My favorite Japanese is the orange helicopter fabric. I like the new Facebook page! I just signed up for the Pink Chalk Fabrics newsletter, thank you! My favorite import fabric is the Kokka Train Station. I already like Pink Chalk Fabrics on Facebook! I already receive the Pink Chalk Fabric Newsletter! I already receive Pink Chalk's newsletter! I LOVE the whole Echino line - especially the eyeglasses. Any chance you'll be getting the Echino messenger pattern? I subscribe tot he Pink Chalk newsletter! I have a lot to learn about Japanese import fabrics, but I love the Echino bonbons with the birds! I like Pink Chalk's new page on FB (can you tell I'm a fan?)! Ruby Star Rising and FFA are probably my fave lines. But I also really love Echino! Thanks for the giveaway! I also like this on facebook! I get the newsletter, thanks! I also tweeted about this! Thanks so much! I like Isso Ecco & Heart Flower Natural. I am a big Kokka fan, however Echino is running a super close second. I signed up for the pink chalk newsletter! I already receive Pink Chalk's newletter. So glad you are spotlighting Kathy's shop. I am a big fan of her blog and her website. Yeah, Pink Chalk! I love echino fabrics. My all time favs are probably the cameras and the sunglasses. Thanks for the chance Julie! I'm not very familiar with Japanese import fabric, but the Echino fabric on Pink Chalk's website looks cute. I will have to check into this more. I subscribe to PinkChalk's newsletter. Hard to pick a favorite but I like the bird in echino by Etsuko Furuya Winter 2011 Madrigal Blush. I also subscribe to Pink Chalk's newsletter! I LOVE Heather Ross!! I pretty much love any Japanese import fabrics that have text on them and I am dying to get my hands on some of the fabulous Susuko Koseki prints. I just signed up for Pink Chalks newsletter. I "liked" Pink Chalk's facebook page. Thanks for the giveaway. I Liked Pinks FB page ...thanks for the chance to win! yay for pink chalk on fb! I "like' them. I'm so madly in love with all the Echino fabric. The colors and patterns are just so lovely! And I "like" Pink Chalk on Facebook! Thanks for such a great giveaway!!! It's Facebook official...I like Pink Chalk Fabrics! My fav import fabric right now is Kokka Japan, Trefle Matroyshkas Natural. My favorite import is Nani Iro! Such a beautiful line of fabric!! Posted about the giveaway on my blog. I look forward to receiving the newsletter! my favorite import is far far away 2. I am thrilled that pink chalk is now on facebook. I like pink chalk fabrics on facebook! right now i'm loving kei honeycomb for binding! My fave import is Kokka Trefle Travel Russia Natural - I love those little russian dolls! Just subscribed to your newsletter! fabric ... such gorgeous colours and fun!